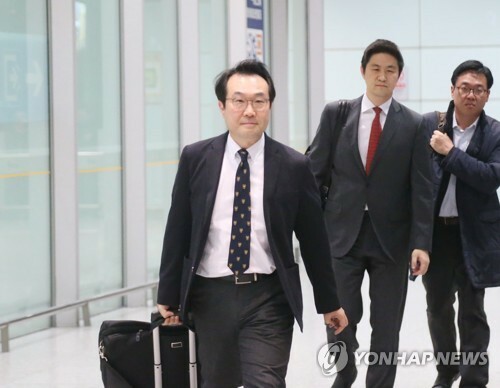 BEIJING, Oct. 18 (Yonhap) — South Korea’s top nuclear envoy arrived in Beijing on Thursday to discuss North Korean denuclearization issues with his Chinese counterpart. Lee Do-hoon, South Korea’s representative for Korean Peninsula peace and security affairs, is scheduled to meet Kong Xuanyou, China’s point man on the Korean peninsula affairs, in Beijing on Friday. Both Lee and Kong are chief delegates to the six-party talks on North Korea’s nuclear program. The forum also involves the United States, Russia and Japan, and its last session was held in December 2008. Their upcoming meeting comes a week after Kong had talks with North Korean Vice Foreign Minister Choe Son-hui in Moscow. Choe and Kong also had a trilateral meeting joined by Russia’s top nuclear envoy, Igor Morgulov. Asked about whether he plans to meet other Chinese authorities or North Korean officials during his stay in Beijing, Lee said he hasn’t set any additional meetings besides the talks with Kong.